Um… As soon as you turn the knob from the other side – which is downwards, wouldn’t the chain just fall off? Not to mention grenades need a shock to set them off even after the pin is pulled. Then again, it’d probably fall off regardless, because it’s only taped to the wall. Maybe the chain is taped to the knob? What kind of toy grenades have YOU been playing with? Dammit crazywalsh81 thats what I was just going to say, so I’ll second that. No way scotch tape would hold up a grenade. Has anyone considered just accepting the joke and moving along? No, thats too hard for them. Seriously, it’s just a stupid picture. And it’s not like most of you have ever even really handled a live grenade, but thanks once again for the free, secondhand visit to Wikipedia/Google search results. ALSO THE GRENADE IS FAKE! Once you’ve pulled Mr. Pin from Mr. 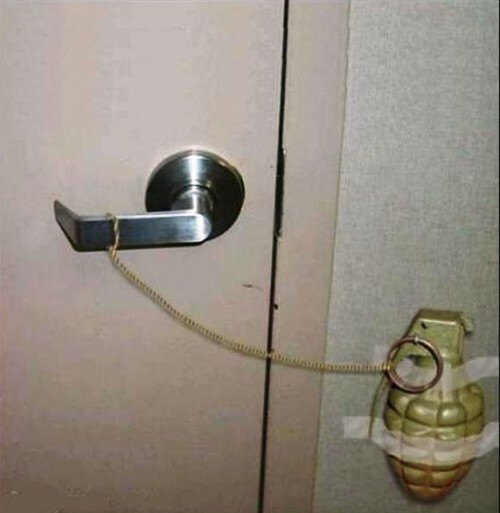 Grenade, Mr. Grenade is no longer your friend! LOL GUISE WILL IT TAKE OFF LOL AMIRITE?? Looks like a Polish boobie trap to me. Phail grenade booby trap is PHAIL.